By now, we all are aware of the objective facts on the ground in Iran when it comes to political dissidents. We have read about the screams of Nasrin Sotoudeh echoing through the women’s ward in Evin Prison as she was subjected to torture by the regime. We have wept over the battered and broken body of young Mohsen Beikvand, whose words and flesh testified to his unspeakable tortures in Rajaei Shahr prison in the months prior to his arranged murder in prison. We all know what happens to political prisoners in the Islamic Republic’s torture houses. And so does UNHCR, the United Nations Refugee Agency, whose mandate it is to ensure that all of those fleeing persecution in their home countries are given asylum, international protection under the auspices of the United Nations, and help finding permanent solutions for their situation. Which is why the UNHCR’s blatant violations of the rights of well-documented former Evin political prisoner Mohammad Ghamari Tabasi and his family are all the more outrageous. 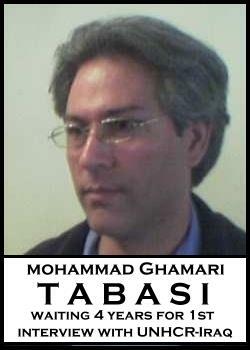 Mohammad Ghamari Tabasi is a known former political prisoner from Iran. After his release, he fled Iran for Iraqi Kurdistan in 2007* with full documentation in hand about his imprisonment in Evin, and with numerous letters of support from various political and human rights organizations testifying to his extensive political activities against the criminal Islamic Republic regime, and thus his legitimate fears of further persecution. 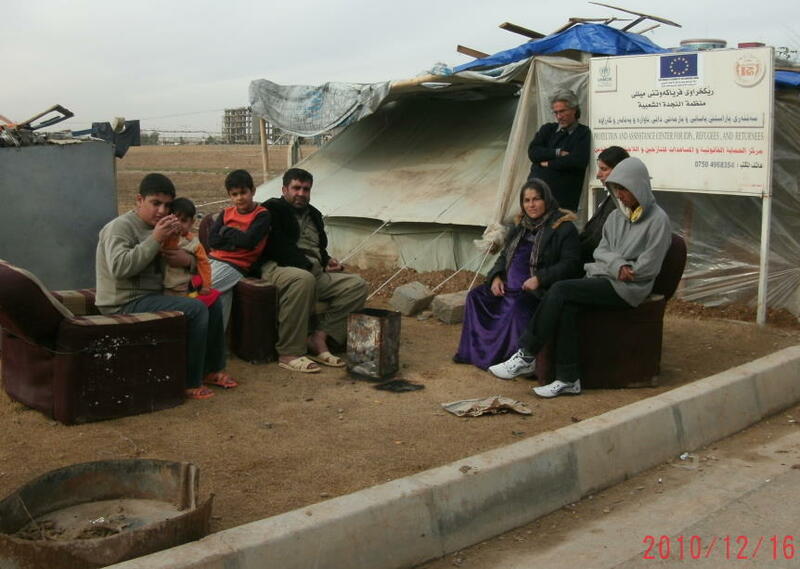 And after four years of waiting for refugee status in Iraq, UNHCR still has not granted even a first interview for Tabasi and his family, which includes his son Sena and his wife Farhat. 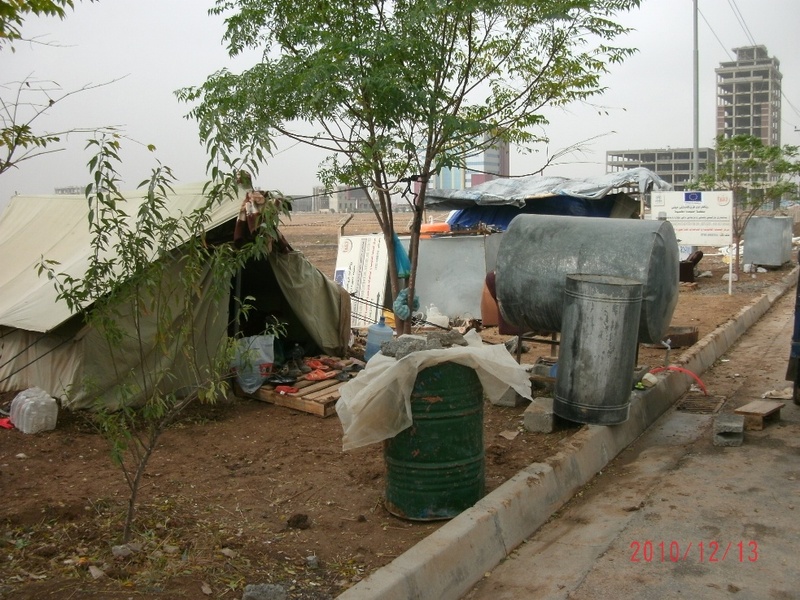 Mohammad, Farhat, and Sena have been living in tents that are pitched in squalor outside of the UNHCR compound in Erbil, Iraq, for the past 89 days, along with another family of asylum-seekers. There is no running water and no sanitation in their camp. Four years of waiting for a response from UNHCR, and Tabasi and his family have nothing more than an asylum-seeker certificate that expires on 21 December 2010 – in just 4 days. And although this family has been living outside of the UNHCR offices for 89 days, they have yet to receive their first interview. 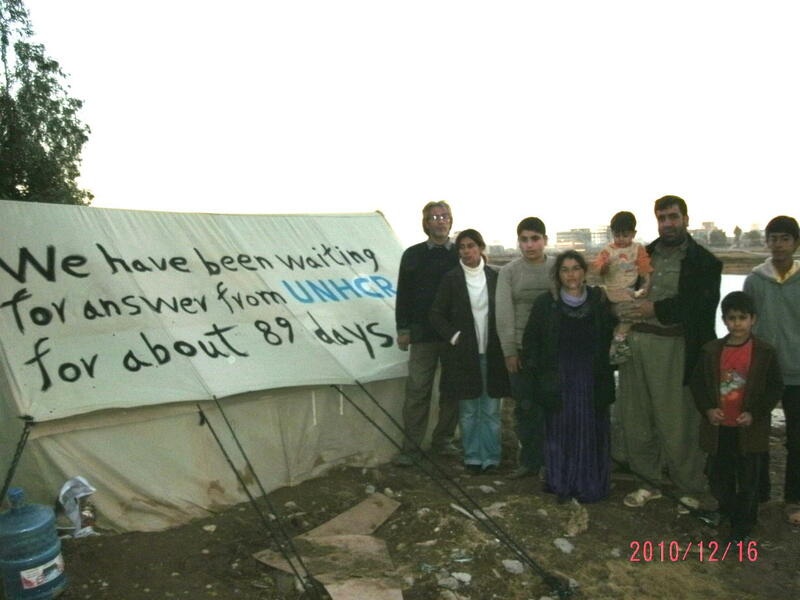 When Tabasi’s family first moved to this spot to demand recognition of their rights as asylum-seekers, they were allowed to use water and other facilities from the UNHCR office across the street, and the residential neighbors in the nearby community had offered them their use of toilet. However, after 3 days, they were asked not to enter the UNHCR office to get water or to use the facilities. UNHCR staff told the neighbors not to help Tabasi and his family so they would go away. The UN guards have gotten into several verbal fights with the family. This is how UNHCR treats Iranian asylum seekers who are known opposition activists with full documentation of their political imprisonment in one of the world’s most notorious prisons. And it is a glaring red flag: we should all be concerned about the way that UNHCR is handling the cases of thousands of Iranians who have fled the abject brutality of the Islamic Republic with no documents, no letters of support from political organizations or human rights agencies, with nothing but the clothes on their back and their very legitimate fears of violent persecution by the Islamic Republic regime – fears that are sufficient basis for UNHCR to recognize their full complement of rights as refugees. Four years is shamefully too long to wait without even an interview. We demand that UNHCR process the asylum application for Mohammad Ghamari Tabasi, Farhat Hussaini and Sena Ghamari Tabasi immediately and resettle them in a third country without delay. We also draw attention to the other family living in the same camp with the Tabasi family, which includes a mother who is heavily pregnant and due to deliver any day now, and a 2-year-old boy with chronic diarrhea that has lasted for weeks. 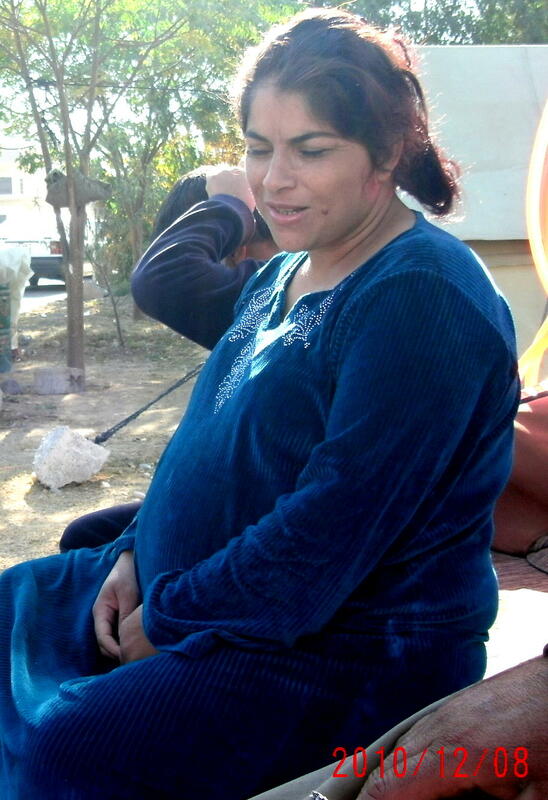 This mother has had no care for her pregnancy, and expects that she will be forced to deliver her baby without assistance in their tent in the coming days. UNHCR’s neglect of the 2-year-old, living right outside its doors, is likely to lead to his completely preventable death: diarrheal disease ranks just behind acute respiratory infections as the top killer of children under age 5. The mother has the right to trained delivery assistance for her impending birth, and the 2-year-old should receive immediate and appropriate care until his diarrheal disease is resolved. UNHCR is responsible for their survival and well-being. The International Coalition for the Rights of Iranian Refugees (ICRIR) does not tolerate UNHCR’s violations of the human rights of asylum-seekers. 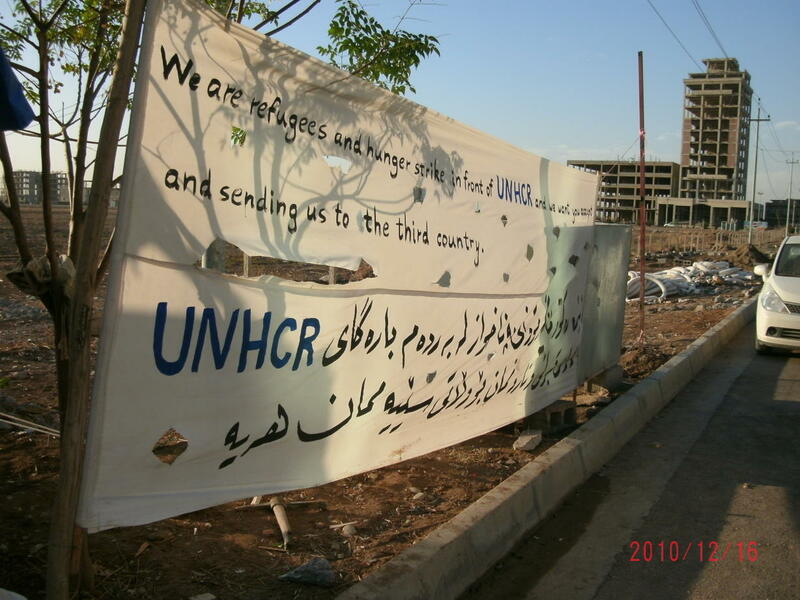 We demand that UNHCR immediately recognize Iranians fleeing their country as prima facie refugees, and until our primary demand is implemented, we demand that UNHCR take immediate steps to ensure that the status determination procedures are efficient, fair, and transparent, and that UNHCR and its affiliated organizations are accountable to asylum-seekers. Members of the ICRIR include the International Federation for Iranian Refugees, the Iranian Refugee Action Network, the Iranian Refugee Amnesty Network, Mission Free Iran and TDCAU. * When this post was originally published, the date given was 2006; on 27 Dec 2010, we were informed that the date should have been 2007 and we adjusted accordingly. « ICRIR PRESSMEDDELANDE den 15 december 2010: ICRIR träffar UNHCR: s representant, Oron över de Iranska asylsökandes protester i Turkiet kvarstår.